1. Brush up on the basics. Remember that home ec class you took in high school? Those skills can come in handy for making your household a little more independent. Knowing a basic stitch (no sewing machine required!) will allow you to fix buttons or mend holes – and prevent you from having to pay someone else to do it or throw clothing away and replace it. Also, cooking your own food will help you stop relying on take-out meals and processed foods. Start small by replicating your favorite take-out dish at home, then expand by cooking a new food every week. Reduce waste with compost. Nutrient-rich vegetable peels, fruit rinds, eggshells, fallen leaves and lawn clippings make super-fortified, all-natural (free!) fertilizer for your lawn and garden. Layer this waste with garden soil, then keep the pile moist, turning it over every few weeks until the mixture is fully decomposed. Preserve. 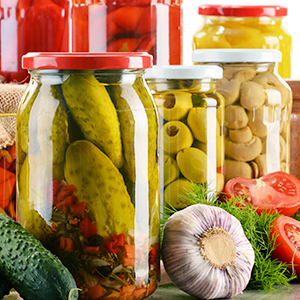 Whether you’re growing your own produce or purchasing it in season, canning, freezing and drying when fruits, veggies and herbs are plentiful and cheap will save you money and keep “fresh” food on the table all year long. Dry naturally. If you have the space – and a few extra minutes – hang your clothes on a clothesline outdoors instead of firing up your electricity-draining clothes dryer. Not only will you save money on your monthly bill, but you’ll also get that fresh-air scent in your clothing for free – no need to purchase dryer sheets to mimic it. Use essential oils around the home. Products that contain naturally derived essential oils, like EcoLogic® pest control formulas, are a logical fit for a sustainable household. The naturally derived essential oils are proven effective against listed pests, making them valid alternatives to using conventional pesticides in your home, lawn and yard.